In just three days, you can visit the wonderful Valley of the Moon, the National Reserve of Los Flamencos and the incredible Geysers del Tatío. 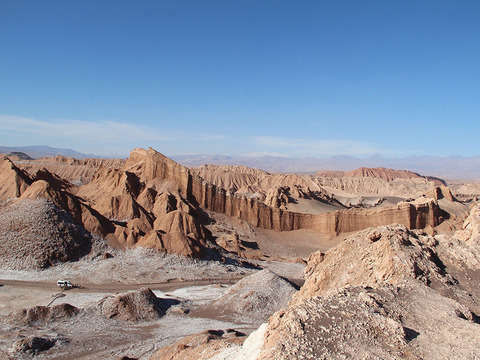 Pick up at the airport of Calama at the agreed time. Reception and transfer to San Pedro de Atacama, from the airport of Calama. In the afternoon, departure from the hotel to the Valley of the Moon (4pm in summer and 3pm in winter, summer season from September 1 approx.). 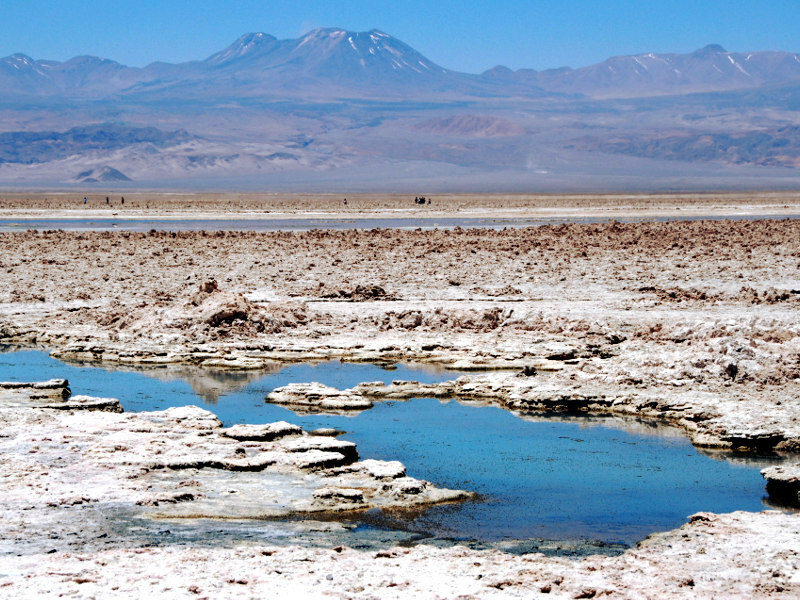 We will go to the path of the Cordillera de la Sal, where we will take a detour to see the beautiful valley that once was the road for the transport of sulfur from San Pedro de Atacama. From here we can appreciate the Valley of the Dinosaurs and the Valley of Death, where you get a spectacular panoramic view of the surroundings. We continue en route to the Valley of the Moon, where we will find geological formations that are the result of successive folds of the earth's crust. Towards evening, the appearance of a bold palette of gold and red painter that shake the soul and the sensibilities of man. 19 km. 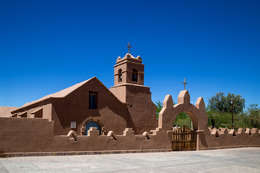 From San Pedro, in the Cordillera de la Sal, is the Valley of the Moon, declared a nature sanctuary and natural monument protected by the uniqueness of its scenic beauty. It is formed by a depression surrounded by small hills with impressive sharp ridges. The tour is an imaginary journey to landscapes that do not correspond to our world, but to other planets. In the valley it is possible to appreciate the salt sculptures known as Las Tres Marías, formed by wind erosion. We will visit the old salt deposits where we can appreciate the rock salt, mineral that resembles quartz, which is nothing more than petrified salt that is found in the interior of the deposits at ground level in some sectors. Following the excursion, we will walk through the interior of the caves, which still remain from the old deposits, to get closer to the Valley where the Great Dune is located. After a break, we will climb the latter, which impresses with its size and serves for extreme sports such as snowboarding. Later we will enjoy the sunset in the Valley of the Moon, one of the most beautiful natural spectacles of the north of Chile. Departure at 09:00 h from the hotel. 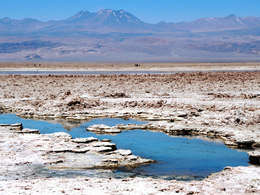 We will go to the Salar de Atacama, which is the largest in the country, where the Flamingos National Reserve is located. We will enter a small path to Laguna Chaxa, where we can enjoy a viewpoint and recognize the different species of flamingos existing in the area. After obtaining photographs of the different birds that occur in this reserve, we will visit the most important lagoons in the area, located over 4,000 meters high, Miñique and Miscanti, which have a beautiful environment and blue waters. In Miñique, the coirón stands out in its surroundings, a small plant typical of the area with which crafts and roofs are made for houses. Miscanti is the nesting place of the tagua, a small black-brown bird. Both lagoons are born from the melting of the volcanoes of the same name. Later we will go to Toconao, located at 2,475 meters high, a small town that has the church of San Lucas and its small bell separated from the church, declared Moumento Nacional and built only in adobe and straw. Here we will visit the small craft workshop and fair in the area, rich in alpaca wool articles and cactus crafts. Return to the hotel in San Pedro at approximately 4:00 p.m.
Departure at dawn from hotel in San Pedro de Atacama (05:00 h pick-up at the hotel). 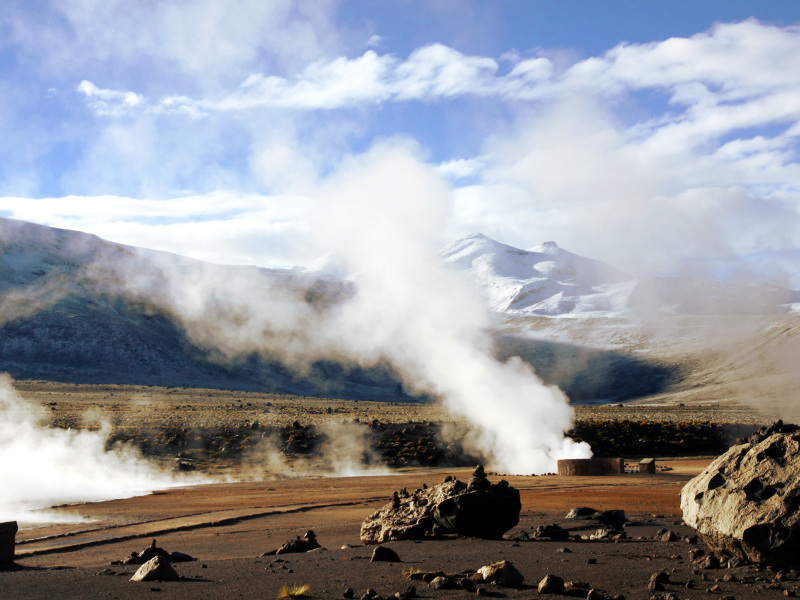 We will go to the Tatio Geysers, a geothermal field located in the Andes Mountains, being the highest in the world (4,200 meters high) and located 89 kilometers from San Pedro. It presents in the early morning hours an impressive activity of steam fumaroles produced by the high temperatures of its watery craters. It is surrounded by hills that reach 5,900 meters high. Around 07:00 the maximum expression of these fumaroles of steam and water with temperatures that reach 85ºC, and that emerge from the earth with strength reaching approximate heights between 7 and 8 meters. In the route and in the place, it is possible to observe vicuñas, llamas, ñandúes and vizcachas, while in the flora the giant cactus, llaretas and coirón stand out. With its famous setting and spectacular scenery, the Geysers are clearly one of the most impressive attractions to visit. In the return we will see the majesty of the Cordillera de los Andes, whose peaks seem within reach of our hands. 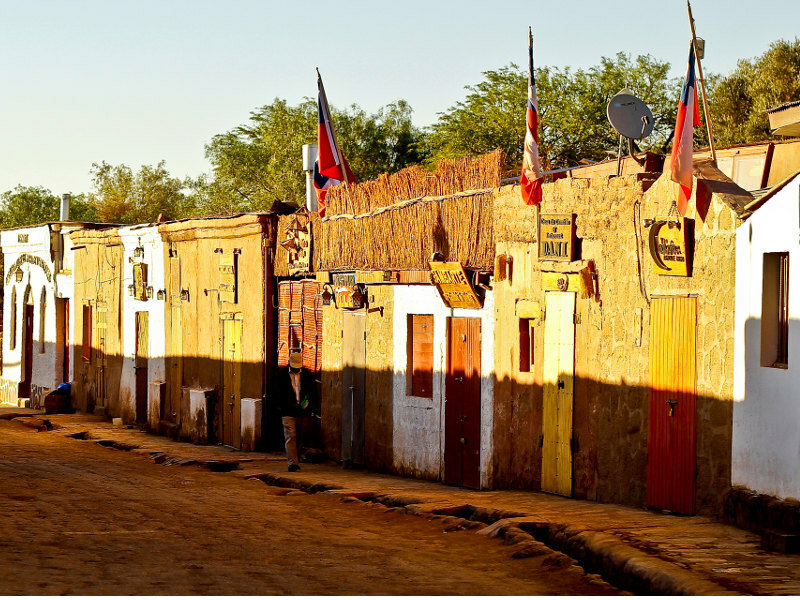 Later we will find Machuca, small settlement of llama shepherds; The town is adorned with adobe houses and thatched roofs. - All transfers, except transfers to and from the Airport between 9:00 p.m. and 07:00 p.m., which must pay an additional cost). - Tour guide in Spanish and English. - Excursions indicated in the itinerary. - 2 nights accommodation at the selected hotel. - Entrances to the parks. 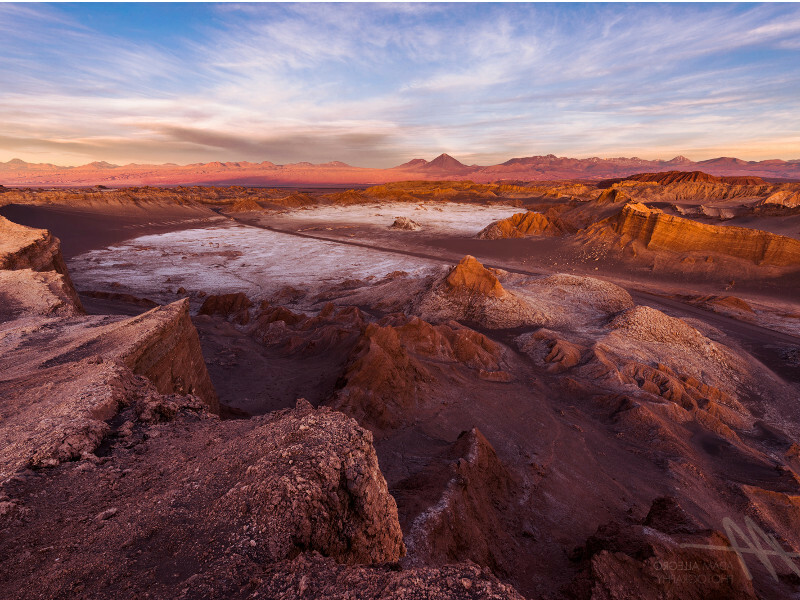 Tickets must be purchased directly in San Pedro de Atacama. Transfers to and from the airport between 9:00 p.m. and 7:00 p.m., must pay an additional cost.